Governor Brown recently issued his proposed climate change investments for FY 2018- ‘19, outlining his priorities as he enters his final year as Governor. The plan focuses heavily on transportation-related investments, calling for billions of dollars in zero emissions vehicle (ZEV) incentives. The plan also acknowledges the importance of Climate Smart Agriculture, but shifts away from water conservation on farms and cuts funding for the Healthy Soils Program. The plan instead focuses on funding farm equipment replacements ($102 million), food processor energy efficiency upgrades ($34 million) and dairy methane reduction projects ($99 million). Click here for the full plan. This shift away from transformative sustainable agriculture investments toward helping the industry meet longstanding air pollution regulatory requirements threatens to undermine efforts to support farmers in adopting management practices that have multiple benefits – reducing greenhouse gas emissions, improving carbon sinks – all while providing agronomic, economic and public health benefits to our communities. Among the disappointments of the Governor’s plan is the lack of proposed climate change investment in the State Water Efficiency and Enhancement Program (SWEEP). As farmers and ranchers across the state are bracing for another dry winter and dismal snowpack, we are reminded by what climate science tells us: California faces an uncertain water future where conservation must become a way of life. The popular SWEEP program funds improvements to on-farm irrigation management to save water and energy while reducing greenhouse gas emissions. The Governor’s larger budget assumes Proposition 68, a natural resources bond measure on the June ballot, will pass and fund SWEEP with a one-time investment of $18 million. However, that funding is dependent upon voters approving the measure and relies on successful future bond sales. As a result, we could be looking at two years of no funding for the program, frustrating farmers and ranchers who were eager to apply, and the state losing out on hundreds of new water-saving, climate smart agricultural projects. After eliminating funding for the Healthy Soils program in the current fiscal year, the Governor’s plan proposes $5 million for the program in the next fiscal year. Governor Brown initially proposed the Healthy Soils Initiative in 2015 to meet the goals of his fifth pillar of his climate change plan – to increase carbon storage in agricultural lands. But since then, the program has been stymied from taking off with only $7.5 million in the first year and no funding for the current fiscal year. Like SWEEP, the Governor proposes one-time Prop. 68 funding of $9 million for Healthy Soils. The legislature will now take up the question of future climate change investments. 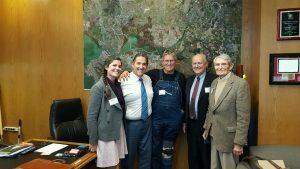 CalCAN will advocate, with our partners, to restore funding for Healthy Soils, the State Water Efficiency and Enhancement Program (SWEEP) and a robust funding allocation for the Alternative Manure Management Program. The Sustainable Agricultural Lands Conservation Program (SALCP), an important farmland conservation program, is the only Climate Smart Agriculture Program with continuous appropriations and not part of the annual budget debate. Andrea Davis-Cetina, Assm. Jim Frazier, Al Courschesne, Dave Runsten and Rich Rominger. March 2017. These two adjacent organic vegetable and fruit farms received a SWEEP grant to install solar pumps, a greywater irrigation system and soil moisture sensors. They also received a Healthy Soils grant to improve their carbon sinks and reduce greenhouse gas emissions. With their Healthy Soils grant, this organic dairy will apply compost, plant cover crops and install riparian buffers to improve carbon storage in soil and woody plants and improve overall all soil health. This Healthy Soils project will support the conversion of a vegetable operation to a no-till orchard, increasing soil carbon sequestration and reducing fuel and chemical inputs. This SWEEP grant funds a variety of water efficiency measures on an avocado orchard near Santa Barbara where water shortages have been severe. It will fund state-of-the-art weather and soil moisture monitoring equipment, improve irrigation efficiency, and fund the application of mulch to preserve soil moisture. With a SWEEP grant, this training center for limited-resource and aspiring organic farmers will install solar power for the pump on its agricultural well, soil moisture sensors and a weather station.